Love it. Even when I think I'm not going like listening to some guests I always end up enjoying the interview and learning something new. Lovely brain food. this has been fantastic.funny and educational.great guests great interviews lots of humour but also serious debates.i like this Russell Brand. Nothing has inspired me more. Fascinating guests and captivating subjects, you've really found some of the most brilliant minds for this Russell. Helping to make sense of the world today and provide hope for a more connected and compassionate society. I'm in. A podcast with online creator and spiritual storyteller Jay Shetty.<br>Lessons in daily self care, spiritual practice and positive thinking. Today we&nbsp; discuss power, corruption, revolution and new systems. This is a proper academic episode, you’re gonna learn. Brad &amp; Henry are brilliant thinkers and brilliant educators. <a href="https://twitter.com/Fearnecotton">Fearne Cotton</a> is on <a href="https://twitter.com/hashtag/UnderTheSkin?src=hash">Under The Skin</a> this week talking about mental health, fame and how to grow up. A very lucid, open and thoughtful conversation. We discuss ideas around body positivity, the way that we relate to food, capitalisms role in how we see ourselves and Megan's journey and recovery out of anorexia. It was a fascinating conversation. We talk about the nature of reality, both virtual, physical and psychological and how these realms intersect and inform us. And what particularly about this time we're living in is difficult and challenging.<br>Laurence Scott is the author of "The Four-Dimensional Human" and "Picnic Comma Lightning" and occasionally&nbsp; hosts the BBC Radio 3 show "Free Thinking". Is it possible to run a business consciously? What does healthy masculinity look like? Stephen &amp; Dave aka The Happy Pear know how it's done, promoting happiness and health in every aspect of life. Today's podcast is with one of my own mentors and spiritual teachers - Radhanath Swami. An enlightening and pragmatic podcast questioning the role of religion, spirituality and our own place in modern society. Check it out and let us know social media what you thought of it tweet me @rustyrockets on Twitter or @trewrussellbrand on Instagram. Can birth be a form of feminine empowerment? Why did footballer Harry Kane receive so much backlash for praising his wife? Today we go back to the beginning and delve into all things related birth - from combatting fear, the power of language and the role men can play. A very positive and insightful episode. Do you suffer from the psychosis of whiteness? What is the politics of Blackness? These are just some of the questions Kehinde Andrews makes us think about during this episode. Honest questions, brutal truths and solutions that could potentially change the world for the better, for everyone. An explosive conversation with controversial conservative thinker Candace Owen - a staunch advocate for the free market, capitalism and Donald Trump. Listen to some heated debates about the pros and cons of the left and the right and an attempt at negotiating what utopia might look like! Tony Robbins - pain, redemption and reprogramming with the incomparable Elvis/Jesus of Personal Development. Darren McGarvey is author of the award winning book "Poverty Safari", he joins us today to discuss the art of social mobility, the politics of poverty and how people from different backgrounds and perspectives can learn to understand one another. Renowned author and spiritual teacher Marianne Williamson joins me on today's podcast to discuss the current disconnect between spirituality and politics, how to to navigate mental health such as depression and whether a spiritual and political revolution is on its way! This Deeyah Khan episode is special. She is an award winning documentary filmmaker who has met and confronted Jihadists and members of the KKK in order to understand what drives them. So much insight, bravery and practical love on difficult topics - religion/race/gender/identity. Also COINCIDENTALLY I barely speak in it. In this episode I'm joined by David Rudolf - the lawyer who represented Michael Peterson in the hit Netflix series "The Staircase". We spoke about what it's like to defend a person accused of murder, if true justice really exists at all and the importance of questioning authority. On today's episode of Under The Skin I'm joined by author Charles Eisenstein to discuss alternative economic systems, find out what's wrong with the current climate change narrative and how we can actually change the world, challenge the powerful and empower the powerless. Today we welcome back Yuval Noah Harari to Under The Skin where we discuss his new book 21 Lessons For The 21st Century. We tackle the idea of the rise useless class, the power of new A.I. technology and what we can do to combat this potential assault on our identity and role as human beings in world. Season #2 of Under The Skin returns next Saturday 13th October! In this teaser you'll hear clips from upcoming episodes with Yuval Noah Harari, Charles Eisenstein, Blindboy from The Rubberbandits and Loki The Rapper aka. Darren McGarvey. We've got some fantastic guests coming up over the course of this series from across the political and ideological spectrum. You'll hear from writers, actors, academics and more including Gabor Mate, Candace Owens, Marianne Williamson, Deeyah Khan, Charles Eisenstein and David Rudolf. Join us next Saturday 13th Oct for Yuval Noah Harari's episode. In this special edition of Under The Skin celebrating the paperback release of my book Recovery - clinical psychologist Dr. Jordan Peterson joins me again to discuss the nature of social hierarchies, where power lies and how to live in harmony. We also compare his 12 Rules for Life with the 12 Steps in my book Recovery. A look back at one of the first and most memorable Under The Skin episodes with filmmaker Adam Curtis about the rise of individualism, where real power lies, and whether we really want change. 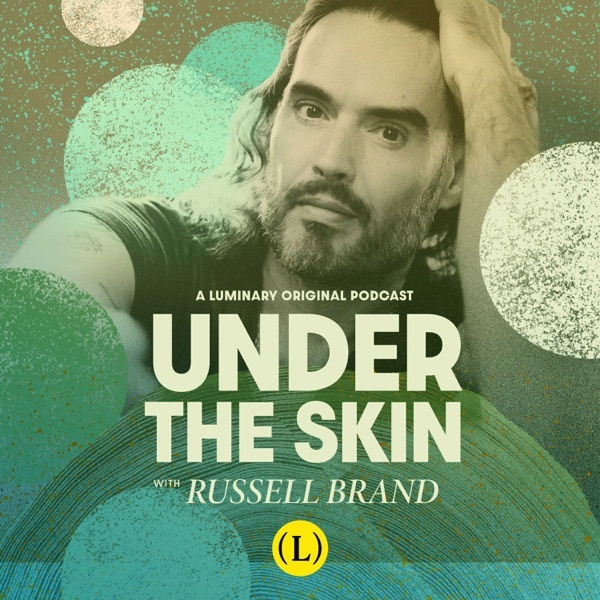 One of my favourite guests on Under The Skin and an episode you should definitely listen to is the fascinating interview where I discuss with Yanis what happens when you take on the political, financial and media elite, and how radical reform can occur. Through accounts of his confrontations with the IMF, European institutions and the German government we examine where true power lies and how it is wielded. With his ever growing popularity I take a look back at my interview with Yuval Noah Harari, author of bestseller ‘Sapiens: A Brief History Of Humankind’. We discuss how homo sapiens came to dominate the world, how our society is built on fiction, the creation of a class of useless people, and the future for our species. Brothers and part of jiu jitsu’s most illustrious family, my guests today are Ryron and Rener Gracie who discuss how Brazilian jiu-jitsu has shaped the people they are today; the pressure of continuing their family’s legacy; how UFC (their father’s creation) has become one of the fastest growing sports in history; and the importance of being able to defend ourselves. Recently making the headlines after a combative interview about the gender pay gap with Channel 4’s Cathy Newman, my guest today is Jordan Peterson, who discusses with me some of his 12 Rules for Life. In a bumper 2 hour episode neuroscientist, author and fellow podcaster Sam Harris and I discuss the effects and rationality of religious belief, the illusion of freedom, Western intervention in the Middle East and where true power lies. Professor Barry Smith discusses collaborative research between philosophers, psychologists and neuroscientists and their discoveries, including how we have many more than the commonly perceived 5 senses. Is Shakespeare still at the heart of British culture? Tony Howard discusses Shakespeare’s continued relevance in reflecting the shifts in British society; the marginalisation of Black and Asian performers; and how the entertainment sector still faces urgent calls for greater diversity. Psychological therapist Emma Kenny discusses new and forgotten ideas around personal growth, gained from 17 years working with people in crisis including some of the UK’s toughest estates. Author of current New York Times bestseller ‘Collusion: Secret Meetings, Dirty Money, and How Russia Helped Donald Trump Win’ Luke Harding talks me through the international espionage, off-shore banks, mobsters, money laundering and computer hacking at the heart of the web of relationships between the Kremlin, Trump and members of Trump’s circle. Historian and novelist Pankaj Mishra joins me to talk about what he calls the ‘age of anger’ - a global pandemic of rage - and how the pursuit of progress and individualism has created a demoralised world. Survivalist and adventurer Ed Stafford joins me to discuss his life changing expeditions and their physical and mental consequences, the lure of extreme isolation and the importance of meditation. Having spent years investigating some of the wealthiest people on the planet, journalist and broadcaster Jacques Peretti joins me to discuss the secret billion dollar deals that we never hear about but which are changing our world and revolutionising everything we do. The brilliant Ruby Wax joins me to discuss her transition from the world of showbiz to becoming known as a campaigner on mental-health issues and a champion of mindfulness. We discuss her own inner battles with self-esteem and her life-changing methods for getting mindfulness into a hectic everyday life. Dubbed “the most controversial scientist on Earth” Rupert Sheldrake joins me to discuss the dogmas within conventional science, the evolving laws of physics, memory in nature, and how science validates and improves spiritual practices. Author and Professor of Black Studies Kehinde Andrews joins me to discuss Britain’s colonial nostalgia, how the west is built on racism, and that Donald Trump is better for black America than Barack Obama. First Lady of New York City Chirlane McCray joins me to discuss America's mental health crisis, why our society breeds depression, the importance of mental health reform, and her organisation ‘Thrive NYC’. Comedian Mae Martin joins me to discuss gender fluidity, breaking down barriers and the compelling statistic that 40% of people under 25 don't identify as gay or straight. Plus, we discuss her experiences with addiction and an intriguing obsession with Bette Midler. In the week of the devastating Las Vegas shooting, author Gary Younge discusses his most recent book “Another Day In The Death Of America” - a harrowing account of children's lives cut short by the ubiquity of gun violence in the US. This show was recorded a few days before events in Las Vegas. This week I'm joined by Carne Ross, a former high-flying diplomat and Middle East adviser who lost his faith in western democracy but put his trust in people power and is now putting forward the case for anarchism. The world's leading Marxist thinker joins me to discuss the contradictions at the heart of capitalism, Marxism’s recent rise in popularity, and why it resonates more today than ever. Author and friend Professor Brad Evans gets under my skin regarding my new book “Recovery”. We discuss the age of addiction, the ability to be liberated from our unhealthy habits and the overwhelming need for human connection. Billy Bragg joins me to discuss music’s changing cultural role, as well as the charge of being a “champagne socialist”, the importance of Grime, and the challenge of inspiring people to make change. Author and anthropologist Jason Hickel joins me to explain how a handful of rich countries have been able to control economic policies in the rest of the world; why we’re being lied to about poverty; and the radical revolution required to stop the global inequality machine. #023 Al Gore - Can We Protect The Planet When It's Not In The Interests Of The Powerful? Environmentalist and former Vice President Al Gore joins me to discuss his new film “An Inconvenient Sequel: Truth to Power”, his feelings about Donald Trump, the corruption of big money, and the future for renewable energy. Dr Robin Carhart-Harris (Head of Psychedelic Research at Imperial College London) discusses unlocking the unconscious, the potential therapeutic uses of psychedelic drugs, and why research into their benefits has been shut down for over 40 years. Author, professor, priest and former atheist Alister McGrath and I discuss the rationality of religious belief, the war between science and religion, and whether faith is still destined to play a central role in the 21st century. Author of “Selfie” Will Storr and I discuss where the ideal of the perfect self came from, why it is so powerful and whether there is any way to break its dangerous spell. Frankie Boyle and I discuss media censorship, the virtues of nihilism, and the effects of fatherhood on life as a comedian. As Naomi Klein discusses her new book with me she explains how the groundwork laid by Bill Clinton and Bill Gates led to Donald Trump’s presidency; the political shock tactics being used to force through destructive policies; and how resistance and imagination can lead to radical change. In a fascinating interview I discuss with Yanis what happens when you take on the political, financial and media elite, and how radical reform can occur. Through accounts of his confrontations with the IMF, European institutions and the German government we examine where true power lies and how it is wielded. On the eve of the UK General Election I talk with Stop The War’s Lindsey German and Dr Brad Evans about how violence has been normalised to the point where as voters we’ve not only become desensitised to it, but have been taught to desire it from our leaders. This week’s show asks: What kind of freedom do we have? Are we responsible for our actions? Do we create our own identity and if not, should we question it? Dr Brad Evans, Rabbi Dr Jonathan Romain and I reflect on the tragic events in Manchester and ask how we can break the cycle of violence. George Monbiot and I discuss the dark money capturing our politics for the billionaires and corporations; the terrifying power of Big Data; and the opportunity for a new democracy. Comedian Simon Amstell and I discuss his film 'Carnage', how veganism began a journey of personal enlightenment and how taking Ayahuasca changed his life.